Evolution and Diversity: Maggots Anyone? Volunteering in a poor government hospital in Africa provides an individual the opportunity to see many things that they haven't been exposed to before. I had always heard of hospitals using leeches and maggots in modern medicine, but I had never had the chance to actually witness it. 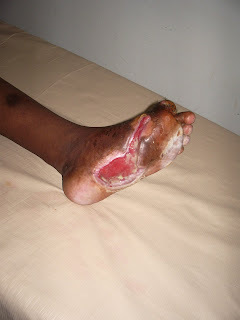 One of the most common problems seen in African hospitals are the complications due to uncontrolled diabetes. Many individuals in Africa can not afford the cost of buying insulin to control their disease and so their blood sugars skyrocket and remain uncontrolled. Uncontrolled diabetes can have serious consequences. Over time, high blood glucose levels damage the nerves and blood vessels which can lead to a loss of feeling or sensation in the extremities; this is called neuropathy (1; 2). Diabetics suffering from neuropathy can develop minor cuts, scrapes, blisters, or pressure sores that they may not be aware of due to the insensitivity. If these minor injuries are left untreated, complications may result and lead to ulceration and possibly even amputation (3). Damage to the extremities, the feet, in particular, are a huge risk (2). Minor injuries, such as wearing a shoe too tight can create a small blister that can cause major damage. Since diabetes decreases the blood flow through blood vessels, the body's ability to heal is severely decreased which increases risk of infection. In diabetics, infections spread quickly (2). You can imagine the risk associated with poor Africans who have uncontrolled diabetes. The environment they live in does not provide them with safe and sanitary places; and some of them are lucky to even have shoes. One particular patient we saw in the hospital was a women with uncontrolled diabetes who was suffering from a severe 'diabetic foot'. She had hit her foot on a tree stump, didn't really notice any pain, and never paid attention to whether her foot had any sores or had been affected by the injury. By the time I had seen her in the hospital, her big toe had been amputated and she had severe necrosis of her tissue. (Necrosis is the death of living cells or tissue (4)). Half of her foot was essentially gone, was full of pus, the stench of dead tissue was unbearable, and maggots were colonizing in her wound. Instead of cleaning the wound and amputating her foot; however, the doctor's were trying to save it. They decided to leave the maggots in her foot to deal with the necrotic tissue. At first, I was thoroughly disgusted and had to excuse myself for a minute, but after getting used to dealing with her wound changes and talking to the doctors and understanding what the maggots provide, their use became more clear to me. Although we see maggots as disgusting little larvae creatures, beyond their development into flies, they do have a viable use in modern medicine. Maggot therapy, otherwise known as Maggot Debridement Therapy or larval therapy, is a type of biotherapy involving the intentional introduction by a health care practitioner of live, disinfected maggots into the non-healing skin and soft tissue wound of a human or animal for the purpose of selectively cleaning out only the necrotic tissue within a wound in order to promote wound healing (5). History of maggot therapy dates back to the Mayan Indians and Aboriginal tribes in Australia. There have also been reports of maggot treatment in the Renaissance times. During warfare, many military physicians observed that soldiers whose wounds have become colonized with maggots experienced significantly less morbidity and mortality than soldiers whose wounds had not become colonized (5). With the modern day advent of antibiotic resistant bacteria, maggot therapy has been successfully introduced into modern medical care as a safe and effective therapy (5). The current use of maggot therapy is estimated to involve over 3,000 doctors, clinics, and hospitals in over 20 countries (5). The mechanisms of maggots have three principal actions. First, maggots debride wounds by dissolving only necrotic, infected tissue. Second, they disinfect the wound by killing bacteria, and third; they stimulate wound healing (5). Maggot therapy has been shown to accelerate debridement of necrotic wounds and reduce the bacterial load of the wound, leading to earlier healing, reduced wound odor and less pain. The combination and interaction of these actions make maggots an extremely potent tool in wound care (5). Although in Africa, the maggots in this woman's foot were not disinfected and controlled like they would be in the modern world, after being in the hospital for a month, the woman's foot was looking immensely better. I was shocked and amazed at the benefit of keeping the maggots in her wound. Even more, I was impressed and moved by the resourcefulness and knowledge of the doctor's that I worked with at the hospital. It made me realize how medicine and care is still possible, even when you have so little. Thinking about the use of maggots in terms of Biology, maggot therapy is just one more example of a possible symbiotic association between organisms. Using maggots in wound care provide nutrients to the developing larvae by digestion of the necrotic tissue and in turn the human benefits as well. It's kind of gross to think about, but in our modern world of more and more antibiotics, and extremely resistant strains of bacteria; if I ever get necrosis in the future....I just might ask the doctor to pass over the maggots. 2) Smith, N. 2006. Personal photo from Portreitz Hospital in Mombasa, Kenya.